On 19-22 September 2017, Ekaterinburg hosted GRAND EXPO-URAL Exhibitions Week comprising 4 specialized exhibitions – LESPROM-URAL Professional, EXPOMEBEL-URAL, AQUAPROM-URAL and UTILIZATION. The exhibitions were officially opened by Mr. Igor Zelenkin, the Deputy Minister of Industry and Science of the Sverdlovsk Region, Dr. Stefan Keil, German Consul General in Ekaterinburg, Mr. Vyacheslav Drobyshev, Head of the Forestry Department for the Ural Federal District, and Mrs. Svetlana Krzhizhanovskaya, Vice President of the Association of furniture and woodworking enterprises of Russia. All of them emphasized the importance of the topics covered by the exhibitions for the Sverdlovsk region economy. Elena Revenko, Director General of the Interregional exhibition company-Ural (exhibition organizer), also extended her welcome to exhibitors and guests. During the VIP tour around the exhibitions, Aleksey Orlov, First Deputy Governor of the Sverdlovsk Region, said that the four exhibitions harmoniously complement each other. He also noted that in the recent years the status of the events has been enhanced, which is expressed in a higher exhibitors quality and a greater variety of participating countries. In 2017, the exhibitions brought together 219 exhibitors from 19 countries and 20 Russian regions. According to Andrey Sobolev, acting Minister of International and Foreign Economic Relations of the Sverdlovsk Region, this shows that the Sverdlovsk region has been growing as an exhibition and congress center. GRAND EXPO-URAL Exhibitions Week features an event-packed program including trainings, seminars, technological exhibition «Renewables – made in Germany», Eurasian Forestry Forum, Furniture Business School, International Matchmaking Event embracing 5 industries, a qualification round of the industrial furniture design national award “Russian Cabriole” and the international World Skills Best Forestry Machine Operator competition. First time this year, AQUAPROM-URAL became a stage for the 2nd round of RUSSIAN WATER CUP, Russian professional skill championship for water supply, public housing and engineering infrastructure specialists. With 17 participating teams, this event in Ekaterinburg was recognized as the largest compared with the rounds in other Russian regions. 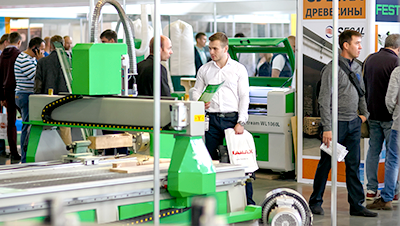 Annual Furniture Business School is another highlight within GRAND EXPO-URAL. This year, the number of registered participants broke the record. “Concise, focused, topical, structured information and real life examples”, one of them commented. The matchmaking event provided woodworking, furniture and HVACR professionals with useful contacts. Representatives of 20 companies from 10 counties (Germany, Italy, Austria, Finland, Slovenia, Sweden, etc.) met over 30 Russian colleagues to discuss possible ways of fruitful cooperation. The total of 30 events featuring 60 Russian and international speakers took place during GRAND EXPO-URAL. In 4 days, the exhibitions were attended by 6000 visitors from 12 countries, 82% of which are professionals.